Winter is here and boy is it C-O-L-D! Gearing up for the freezing cold temperatures requires a coat that can withstand the elements, and it needs to be really great looking too. Keep the cold out and turn up the style in brands such as: Laundry, Perry Ellis, TAHARI, HFX, SAGE Collective, Jacob Siegel and Buffalo David Bitton. 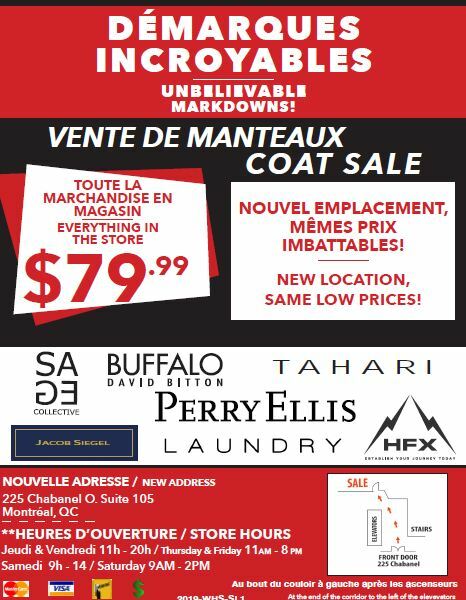 Back by popular demand, one of the biggest coat sales, in Canada is continuing and the markdowns are getting even steeper. Both men and women can scoop up designer named coats all now marked down to only $79.99; an outstanding savings! Hurray in, it’s the absolute best time to buy affordable on-trend outerwear that will help keep you toasty warm. This entry was posted on Monday, January 28th, 2019 at 2:11 pm	and is filed under Clothing, Specialty Store, Warehouse Sale. You can follow any responses to this entry through the RSS 2.0 feed. Both comments and pings are currently closed.